Fatah 'Nakba' messages call for terrorism as 'only' way to take entire state of Israel for its own, while showing off its terror branches. Palestinian Authority (PA) Chairman Mahmoud Abbas's Fatah faction marked "Nakba" day - signifying the "catastrophe" of the establishment of the modern state of Israel - by calling for terrorism to destroy Israel and conquer the state as the "only" way. In a post on the official Facebook page of Fatah on May 14 in time for Nakba day, translated and revealed by Palestinian Media Watch (PMW) on Sunday, a message read, "what was taken by force can only be regained by force, the 67th anniversary of the Nakba." The words accompanied an image showing the number 67 in Arabic numerals, with the digit 7 formed out of an image of a key indicating the "keys" to Arab homes allegedly taken by Israel, along with a rifle, and a map showing the entire state of Israel, including both sides of the 1949 Armistice lines. This, despite Fatah's ambiguous statements indicating apparent support for a two-state solution. The post by Fatah was far from an anomaly for the group, as just a day prior it similarly called for terrorist attacks against Israel. "When the 'storm' Al-Asifa roars and the nation applauds the eternal Fatah, the world's dwarfs should remain in their burrows," it read, with Al-Asifa being a reference to Fatah's "military wing" in the 1960s and 1970s. 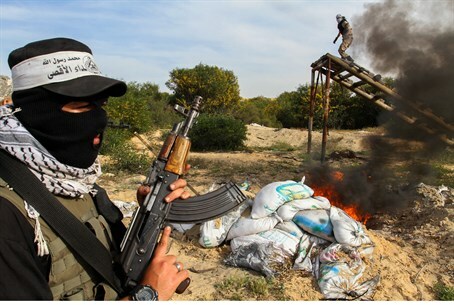 Accompanying the text was a photo of an armed terrorist in Fatah's current "military wing," the Al-Aqsa Martyrs' Brigades, posed next to the Fatah logo which bears two rifles over a map of all of Israel, likewise indicating a desire to conquer the entire state by force. Fatah's calls for terrorism have by no means been limited to words, with the group taking an active part in Hamas's terror war against Israel last summer. Following the war, Fatah bragged of firing countless rockets at Israeli civilian centers in a video, even as Abbas made the outlandish claim that Fatah lost 17 times as many members as Hamas in the war.